Zach Ertz, Travis Kelce, George Kittle, Rob Gronkowski, a fearsome foursome of the most dangerous tight ends in the NFL . Yet, none were drafted in the first round. Why? General managers recognize that the tight end is still not a position of high value. As a matter of fact it would be a mistake for the Green Bay Packers to draft a tight end in the first round of the 2019 NFL Draft. In 2009, the Lions drafted Brandon Pettigrew 20th overall. He became a solid overall player and blocking tight end, but never caught more than five touchdowns in a season. Jared Cook, the man that brought Jerry World* to its knees a few years ago, was taken 89th overall that same year and remains a high level mismatch in the middle of the field. A year later, Cincinnati took Jermaine Gresham with the 21st pick. Gresham is still in the league and is an excellent role model as well. However, the most dominate player to ever play the position, Rob Gronkowski, was drafted with the 42nd pick on the second day of that draft. Flip ahead to 2013, and the Bengals yet again use the 21st pick to select a tight end. Tyler Eifert is a fantastic player when healthy, and one can only hope he recovers and returns to form. Nonetheless, Zach Ertz, he of the game-winning touchdown in SuperBowl 52, was chosen that very same year at pick number 35. Later in that draft, the Chiefs selected Travis Kelce with the 63rd overall selection. One can make the argument these two players, with Gronk’s retirement, are the gold standard of the position. The Detroit Lions selected Eric Ebron of North Carolina 10th overall, making him the highest drafted player at the position since Vernon Davis in 2006. In Detroit, Ebron was an oft-injured, massive disappoint, never catching more than five touchdowns in a season. He broke out in a big way with Indianapolis in 2018 (and for my fantasy team), catching thirteen touchdowns from Andrew Luck. But are the Packers really drafting for production five years down the road? The 2017 NFL Draft saw O.J Howard (Buccaneers), Evan Engram (Giants), and David Njoku (Browns), all drafted in the first round. While it is too early to comment on their overall careers, George Kittle was drafted in the fifth round, 146th overall in that same class. All he did last year for the 49ers was explode with the most receiving yards ever for a tight end in a season. A record once held by Gronk, Jimmy Graham, and for a short time, Travis Kelce. That’s some pretty good company, and makes Kittle, another tight end from Iowa, an absolute steal. To summarize, intelligent football czars do not draft tight ends in the first round. They understand the position has become far more valuable in the pass happy NFL of the past fifteen years. In spite of that, the teams who are successful drafting the position find the value in the later rounds of the draft, while using first round picks to draft players at premium positions. Just look at the teams who have taken a TE in the first round lately. Lions, Bengals, Buccaneers, Browns, Giants, the dregs of the NFL. Other than the Ravens, have any of those teams seen recent success? Do they looked poised to make playoff runs in 2019 off the backs of their dominate first round tight ends? The 2019 tight end class may be the most talented in recent memory. 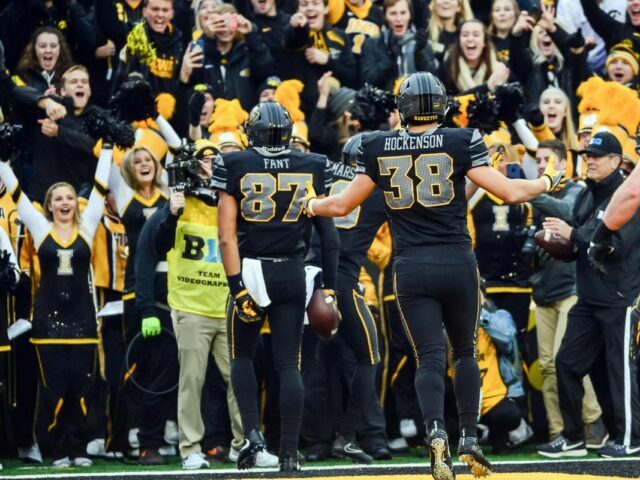 Noah Fant and TJ Hockenson are top level players. Despite that, the level of depth at the position in this draft should allow the Packers to grab an impact player after the first round. Be it Irv Smith Jr. of Alabama, Dawson Knox of Ole Miss, or Caleb Wilson of UCLA there are talented players that can be had in later rounds this year. Intriguingly, the Packers recently had a top-30 meeting with Jace Sternberger, the tight end from Texas A&M. Green Bay may have already shown their hand with their interest in a player expected to be available far after the first round. Ultimately, drafting a tight end after the first round in this years’ draft could easily prove to be the most logical and prudent decision for GM Brian Gutekunst to make. This entry was posted in NFL Draft, Packers 2018-2019 Season, Packers News and tagged Green Bay Packers, Iowa, NFL Draft, Noah Fant, Rob Gronkowski, TJ Hockenson. Bookmark the permalink.